This week I had the chance to jump in Linkrealms, a very particoular MMORPG, currently in closed beta (remember that you can get a key for the closed beta right here), developed by a little indipendent company, Mythyn Interactive, and I played it for a while. Before going on and tell you my thoughts on the game, I think an introduction is required. I you are a casual gamer or a big fan of wow-style themepark MMORPGs this game is not for you. 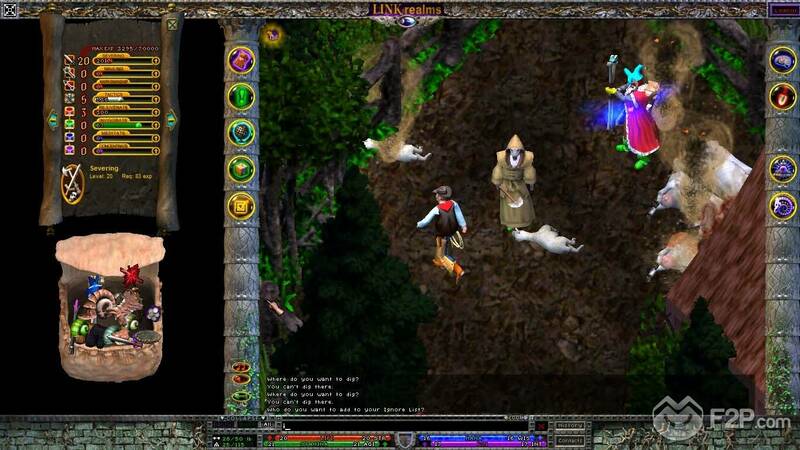 Linkrealms is an old-school sandbox mmorpg that requires a lot of patience and dedication to be enjoyed. The game aims to a very niche audience and will probably make some Ultima Online fan very happy. It's not a secret that the game is heavily inspired by the Richard Garriot's masterpiece and try to recreate that old-fashioned style and feeling removing some dust, bringing it in 3D and adding some modern features. Let's give a look to the result. Before moving my first steps in Linkrealms I knew its resemblance and common points with UO, but I never played it so I logged in to the game with my pure and totally virgin "modern MMORPG player" soul. The first thing I noticed is that there is no character selection screen. You can only create one character for account and I didn't see any way to delete it in order to create a new toon. The races are currently only 4: Human, Demon (Incubus/Succubus), Canid (male humanoid dog), and Kitty (female humanoid cat) but with the exception of the humans they are somewhat original compared to the usual elves/orcs/dwarves. You can customize your character with a bunch of heads, skin and eyes colors and tails. The interface is something I was absolutely not used to. Basically you have your actual game window at the center of the screen screen where you can control you character, and some empty space on the left and the right side to freely place your bags, skill pages and so on. At the left and right edges of the central game window you have 2 vertical column with some button on them: inventory, quest log, map, realms editor, options, skills, weapon/tool/magic /techniques(this change depending on what you have equipped and if you are in combat mode), clairvoyance(magic and some abilities), and spiritualism (the only unlocked skill in this tab was “collect soul " but I didn't figure out how to use it). Your bag have no slots and you can move the items inside freely, this means that youi'll have to be organized or it will soon become a mess. Your character bars (health, mana, stamina and psionic ) are on the bottom of the screen. The graphic is really poor compared to the modern productions but you have to consider that the company behind the game is really small and the title is designed to appeal an audience that can go over the graphic and appreciate the game's visual style. Same thing for the audio section. I wanted to start exploring around, trying combat, magic, crafting and all the contents the game has to offer, but I have to admit I was completely lost. The game is far from being new-player friendly, there is no tutorial (just a nearly-useless advice box). In addition, things in this game work in a really different way compared to your usual MMORPGs. For example to fight something you have to enter in combat mode clicking on your weapon icon or pressing tab and then choose your target. To performe a combat tecnique you have to select it from the techniques menu and you will use it with the next attack. There is no action bars to place your techniques or spells so you have to keep your spellbook and skill tabs always open. Remember to exit combat mode after a fight or you can ending up in some accident like killing your pet or worse. In order to cast a spell you have to equip your staff, precast the desired spell and then click on your target to actually launch the spell. 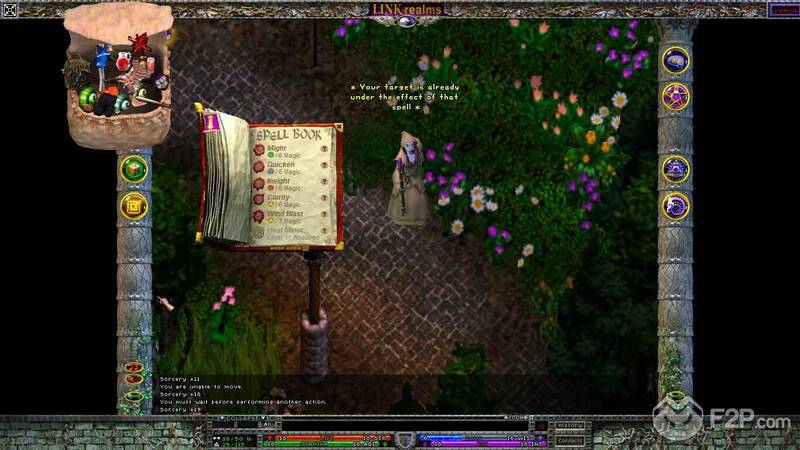 Maybe this mechanics will be familiar to Ultima Online veterans but I had to search some guides on google to quickly understand how to do a lot of things like clicking on your character to open the paperdoll (there is no character tab button) or figuring out that I had some skills to recover my health, mana, stamina etc. There is a really hard learning curve here that could discurage a lot of players but I think that you have just to get used to this mechanics because are really different from the usual modern MMORPGs. Speaking of character progression, the game has no classes and no levels. 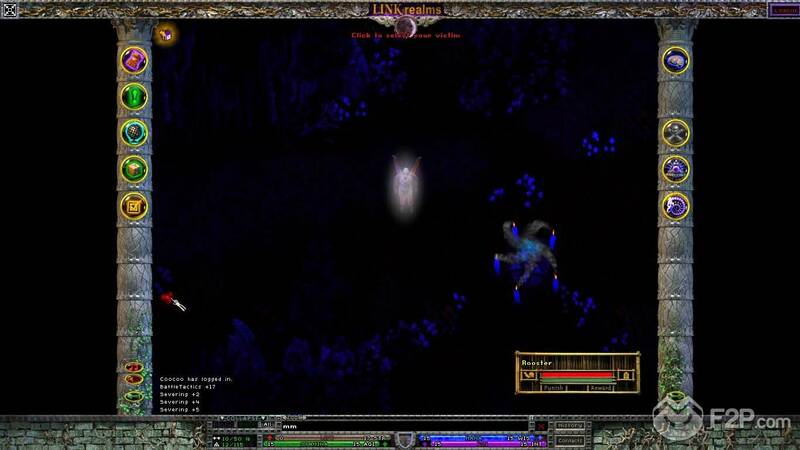 Following the example of Ultima Online, the game offers a skill-based system with a soft-cap and you can decide which skill to block or decrease and which one to train. Everything from weapon proficience to magic and crafting will improve just using it and will eventually unlock new skills. This means that at the beginning you will fail almost everything you try to do. Hitting with your sword, casting a spell and even squeezing some tomato jouce will be really hard tasks wih extremely low success rate that will improve with practice. In my opinion this kind of progression system is better than a level-based one because you can actually feel you character growing and becoming stronger with time and you have full control on its progression without being restricted by any class.The down-side of this system is that it involves a lot of grinding repeating the same actions in order to make your skills grow up. The crafting is very fun and deep. Like everything in the game it comes with no tutorial and you have to figure out by yourself how thing works. I had fun finding and refining the materials in order to product my stuff like tomato juice to heal me or some leather robe to wear. The crafting in a sandbox mmorg is an essential element and thought I managed to try just the first things it seems that in Linkrealms it's something to enjoy. One of the main feature of the game is the possibility to create your own realms by paying a monthly fre. You can completely customize your realms, building your house, or anything you want, growing your plants, farming your animals and setting your rules for the visitors. It's your world and you can shape it the way you want thanks to a complete, deep and really complex editor.While exploring the world I entered some zones that I think were Players-created realms with a lot of strange and original buildings, plantations and cool stuff like usable slot machine and so on. The game also has some PvP zones with semi-loot zone (you'll drop just some of your stuff on death) that will make the PvPers happy. There are some open dungeons too that will challenge you and your friends. There are quests too but in a classic sandbox style will just be an optional thing that reward you with some silver. Another really interesting thing is the pet system. When you obtain your Rooster pet you can summon it whenever you want, but it has its own AI and won't blindly follow your orders. You'll have to train it shaping its behaviour. In addition you can breed your pets and the offspring will receive cosmetic elements and genes from its parents. Linkrealms is a very particular game that probably will not appeal the big audience of themepark players and casual gamers. It is a complex and deep Ultima Online style sandbox that requires patience and dedication to be enjoyed. But if you are a sandbox fan and you can go over the old graphic and the unintuitive first-impact you can find a game that have the potential to entertain you for some time. Requiring a lot of time in order to progress I didn't have the chance to see the "endgame" and the zones with harder monsters and dungeon, but I read of a lot of veteran players complaining about lacking of advanced contents . Linkrealms is still in beta and have some time to get better and add some contents. We hope that Mythyn can refine this interesting raw gem and transform it in a competitive and complete product (maybe adding an exaustive tutorial) because a lot of Ultima Online fans and sandbox players would really love it. One Comment - "Linkrealms exclusive preview"
You clearly do not know how to review a video game let alone an MMORPG. You lack the mental capabilities to interact with your source material, and thus your ‘review’ is pointless.